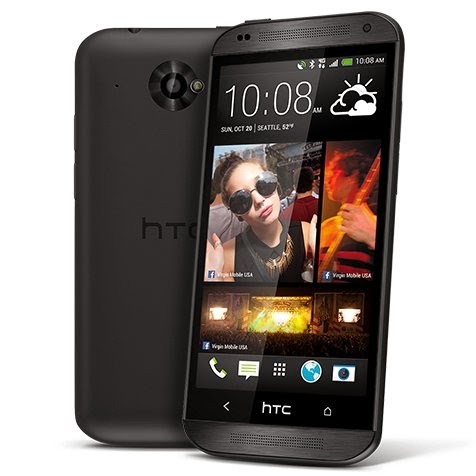 Virgin Mobile's latest phone, the HTC Desire 4G LTE , is now available on the Virgin Mobile site for $279.99. Appearance wise the Desire looks very much like a smaller version of HTC's current flagship, the HTC One. While not in the same class as the One, the Desire is a solid mid-range LTE Android phone with a dual-core 1.4 Mhz Qualcomm Snapdragon processor, 4.5 inch 540 x 960px display, auto-focus 5MP camera with LED flash and VGA front-facing camera. The battery is removable and there's 8GB of internal memory, 1GB RAM and a microSD slot that supports up to 32 GB memory cards. The Desire runs a custom version of Android 4.2 with HTC's popular Sense overlay. Here's the Desire's User Manual: download PDF, view online. The HTC Desire can be used with any of Virgin's Beyond Talk plans, which start at $35/month for unlimited LTE or 3G data (throttled to "3G speeds" after 2.5 GB), unlimited text and picture messaging and 300 voice minutes. Solid phone, solid price. virgin mobile so so. I would rather have a Moto X for $299 on Republic, or a $349 Nexus 5 from the Playstore on Ting or other MVNO. Sprint plays weird msrp games. This phone probably goes on 15pct off sale indefinitely. First party phones usually get bad accessory support. Hand me downs work better. Where is the evo lte?